00:10:00 Makes 2 servings, 1/2 cup (125 mL) each. 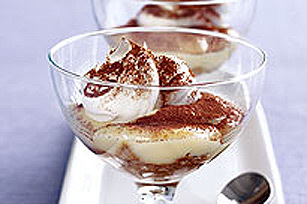 Cap off a terrific meal for two with this creamy treat. The perfect portion size won't force you to test your willpower. Substitute 2 Tbsp. leftover cooled brewed Maxwell House Coffee for the instant coffee dissolved in the hot water. Desserts can be prepared ahead of time. Prepare as directed but do not top with reserved wafers. Refrigerate up to 4 hours. Garnish with reserved wafers just before serving. Serving Size Makes 2 servings, 1/2 cup (125 mL) each.